﻿ Whales Dream Pension, Namhae-gun | FROM $69 - SAVE ON AGODA! "All enjoyed their stay and thought it was comfortable and re..."
Have a question for Whales Dream Pension? "We stayed at the deluxe room with ocean view and the room was fantastic!" "The room and toilet were spacious and clean with utensils provided for us to cook as well." "In Whales dream, the service is nice, the host is very welcoming and serves you well." 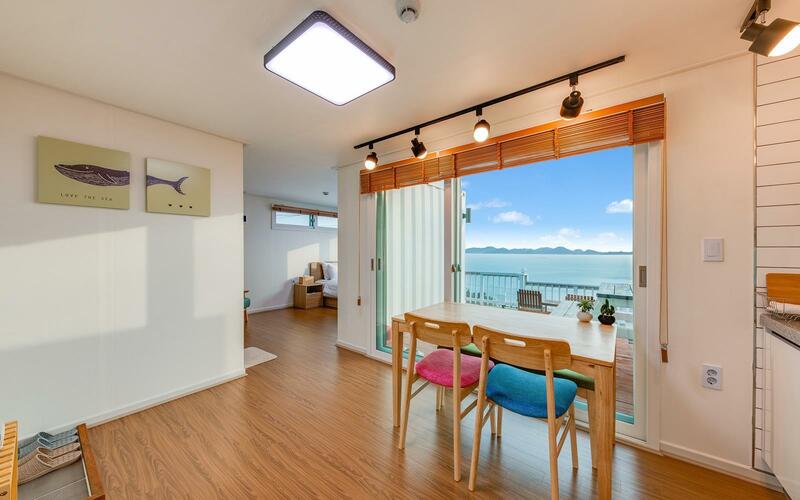 "Very well located in a small village in Namhae, we enjoyed t..."
Conveniently located in Namhae-gun, Whales Dream Pension is a great base from which to explore this vibrant city. Only 20 km from the city center, the hotel's strategic location ensures that guests can quickly and easily reach many local points of interest. With its convenient location, the hotel offers easy access to the city's must-see destinations. Offering hotel guests superior services and a broad range of amenities, Whales Dream Pension is committed to ensuring that your stay is as comfortable as possible. A selection of top-class facilities such as free Wi-Fi in all rooms, 24-hour front desk, express check-in/check-out, luggage storage, Wi-Fi in public areas can be enjoyed at the hotel. In addition, all guestrooms feature a variety of comforts. Many rooms even provide television LCD/plasma screen, internet access – wireless, internet access – wireless (complimentary), whirlpool bathtub, non smoking rooms to please the most discerning guest. The hotel's golf course (on site), fishing, water sports (non-motorized) are ideal places to relax and unwind after a busy day. 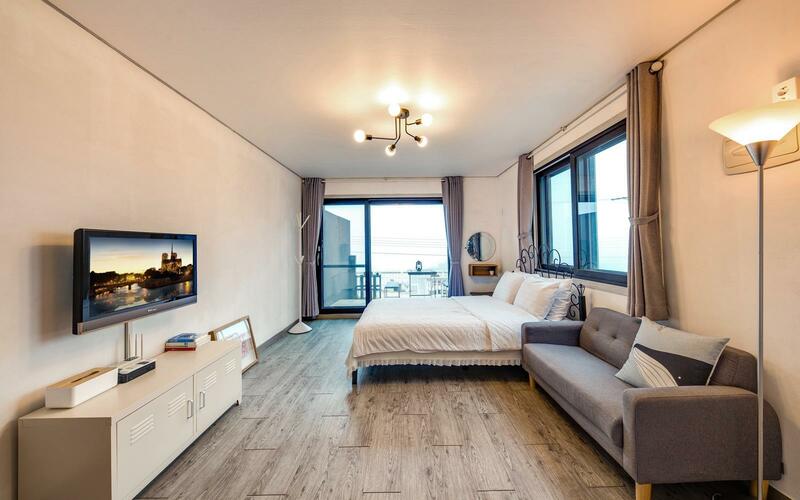 Superb facilities and an excellent location make the Whales Dream Pension the perfect base from which to enjoy your stay in Namhae-gun. "The view from the room was fantastic and we had a great stay..."
This places is owned and run by young couple who seem to be efficient, considerate, disciplined. As soon as booking was confirmed, they send you separate message and instruction via WhatsApp including short guide for the Namhae island. The view from the room was fantastic and we had a great stay. Everything was perfect including electrically warmed toilet! Strongly recommended. Your detailed review is really impressive. We will always be a young owner with a sense :) Thank you!! We stayed at the deluxe room with ocean view and the room was fantastic! The room and toilet were spacious and clean with utensils provided for us to cook as well. Breakfast was simple affair with toasts and cereals provided. It was a pity that it was foggy for all 3 days when we were there and we were unable to enjoy the view that our room could have offered. It was difficult to travel around here as there's not much public transport but the owner kindly helped to arrange full day taxi tour for us. Overall, I enjoyed my stay there. 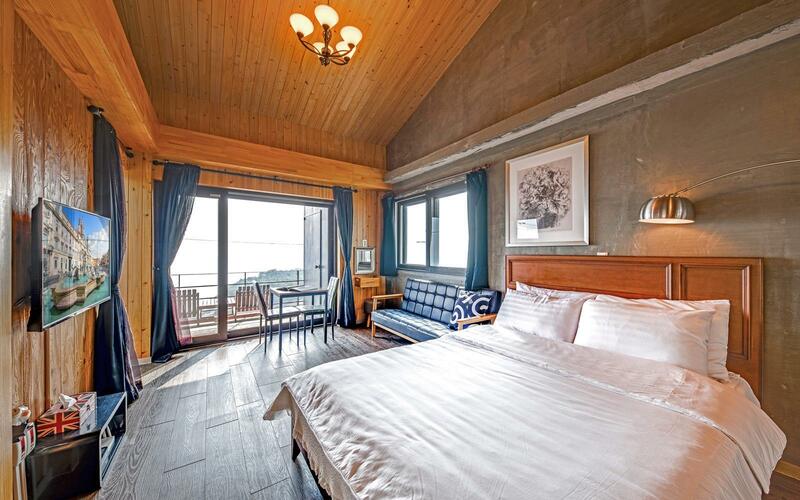 Very well located in a small village in Namhae, we enjoyed the beautiful view to the see from our room on the 1st floor. In Whales dream, the service is nice, the host is very welcoming and serves you well. For our next trip in Namhae, I'd like to book again and I'll recommend this Whales dream to my firends also. My husband and I stayed at Whale's Dream for 2 nights and really enjoyed ourselves. The manager of the Villa, Jieun-ssi was very warm and friendly but was also very respectful of our privacy. The room was very clean and the facilities were great. Immediate warm water was always available, a decent hairdryer and good working air conditioning and heating. The pension itself is located very close to Daraengi village. One thing I partciularly appreciated was that Hieun was easily contactable on Line and seems to always be happy to help :) Thanks for the stay and I wish you all the best Jieun-ssi! The location is quite far away from the town about 45 mins travelling time by taking public bus. And the bus schedule is not so frequent only every 1 -1.5 hour and after 16:00 the last one is around 20:15. It's better to rent a private car during yr stay. Another alternative is by taxi only take around 25 mins. It is a very nice place and worth to go during spring or autumn I think. Lovely place to relax & unwind with clean, spacious & quiet unit. Great view of the ocean. Warm hospitality from owners, they are fast to respond to our needs and friendly Aunty made us delicious snacks too. Great service from the proprietor and his family before arrival with photos to help find the place and local information. Loved sitting in the tub watching the ships entering and leaving harbour. Thanks very much! 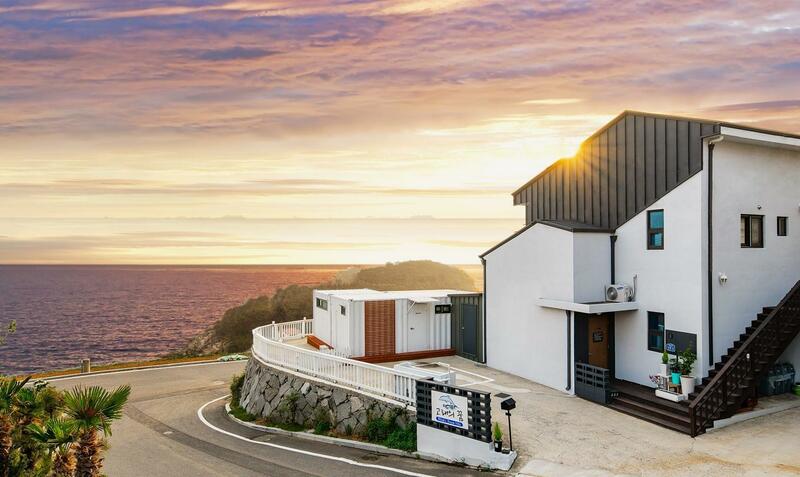 The Whales Dream Pension is located on the southern (remote) tip of Namhae Island with amazing views over the coast and Yeosu. The proprietor family is very kind and supportive with decent/good English. The rooms are furnished "Scandinavian style". We stayed in a big room with a very nice tub right at the window. Western breakfast is provided. Mr Won Chul demonstrated superior service, in English, from the time we booked this room until the time we left :-) He promptly replied to all our questions and gave detailed tourist/cultural info, as well as recommending a great Korean BBQ restaurant in Namhae - Cattle Treasure Island Plaza 055-863-9292. We had the standard room on the first floor with a private balcony. The pension is on a hill so even first floor rooms have a good view of the water and surrounding peninsulas. The key provided is for the door at the back of the building but you enter the room from the other side, from the private balcony through the glass sliding doors which automatically lock when shut all the way. We didn't know this and inadvertently locked ourselves out of the room and had to call Won Chul at 10pm and he came within 5 minutes to let us back in, and then gave us a lovely bunch of juicy grapes! He helped us in so many ways, so patiently, politely and willingly - a thousand times, thank you! 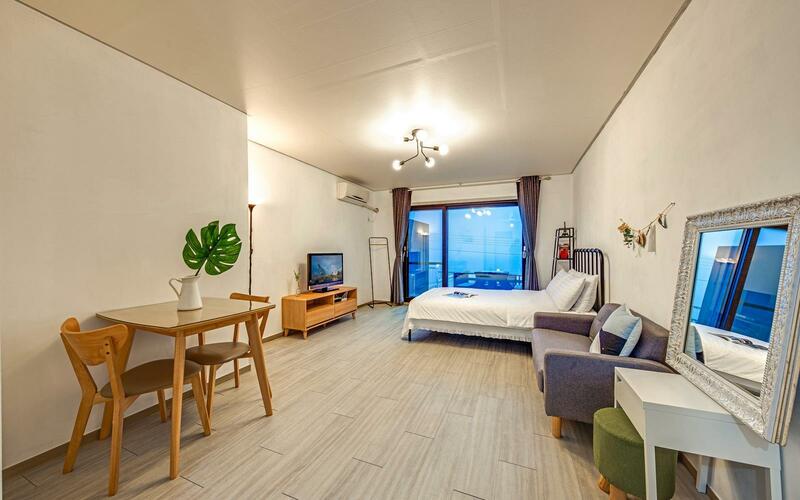 I stayed at the Pension while visiting the Namhae, and the room is fantastic for the price. The pension is very clean and modern on the inside, and the jacuzzi tub and balcony both offer sweeping and breathtaking views of the ocean. The owners were very helpful with directions and advice for sightseeing, and there is a bus stop just outside the pension for easy access back to the center of town. The breakfast in the morning offers a great variety and is delicious! I will definitely stay here if I come to Namhae again one day, this is one of the best pensions I've come across! We stayed here for 2 nights and thoroughly enjoyed my experience there. Its located near Darangyi Village which is a must-see if you are going to Namhae. The owner speaks english and we had no problem finding our way around the place with his help. As we did not drive, taxi can be arranged by the owner to bring you around the island. Breakfast is simple but delicious. Rooms have well equipped kitchen, toilet, strong wifi and cable tv. Convenience store is located just down a slope. Very welcoming people and good service. we really enjoyed our stay. The owners were extremely nice and helpful. We are already planning to go back. Very hard to find Pension as not written in English so needed to ask where it was. Not really suitable for dining as the area they use for breakfast was very untidy and not many chairs.on a positive note we were given a drink and snack when we arrived. we stayed here with my kids and their grandparents. All enjoyed their stay and thought it was comfortable and relaxing. excellent service! Love the pension , it's very comfortable n the host is very helpful . wonderful view, calm air, clean room, kind step. 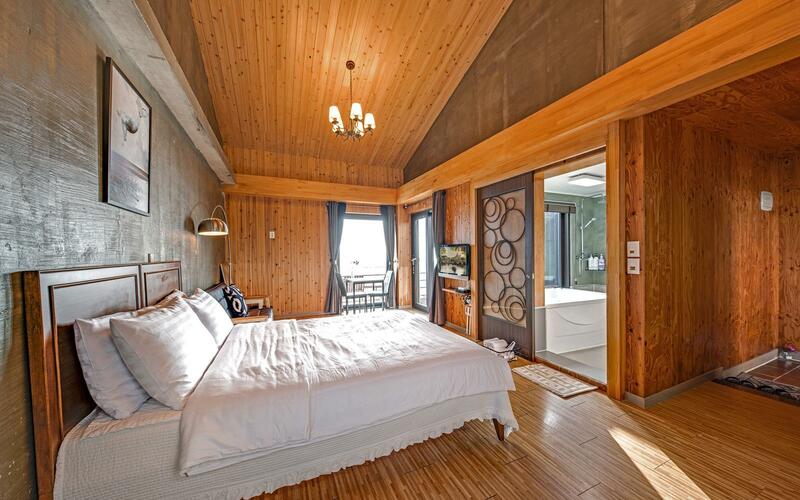 Probably the best stay you can get on Namhae island. Exceptional in all aspects. le bâtiment et raccordements et tout bricolés ! pas de porte manteaux ni d'armoire pour mettre ses vêtements salle de bain petite avec pareil WC lavabo et douche qui marchent ensemble logement froid pas assez chauffé ! petits déjeuners un panier pour nos 2 jours à l'arrivée par la mère âgée ! logement mal indiqué difficile à trouver vus sur la mer très cher pour ce logement qui ne le vaut pas !